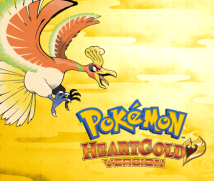 HeartGold and SoulSilver which we are discussing today are remakes of Pokémon Gold and Silver. Previously, you also remade Red and Green, didn’t you? Yes, they were remade as FireRed and LeafGreen17. So this makes HeartGold and SoulSilver the second time in the Pokémon series that we’ve released remakes. 17 and were released for the Game Boy Advance in Japan on 29th January 2004 and were remakes of Red and Green with a whole host of additional features. At the time of FireRed and LeafGreen, I remember thinking that while these were great titles for people new to Pokémon, at the same time, it wouldn't do for them to be identical to the old titles now that the hardware had changed to the Game Boy Advance18. That’s why I went to show you the Wireless Adapter19 which had just been completed. Basically, my intention was to put the hard sell on you. 18The Game Boy Advance was the next console in the series after the Game Boy Color and was released in Japan on 21st March 2001. 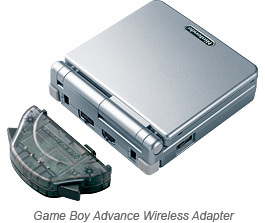 19The Wireless Adapter was an accessory for the Game Boy Advance which allowed multiplayer wireless play. It was released packaged with Pokémon FireRed and LeafGreen in Japan on 29th January 2004. I thought that I simply had to show this to Ishihara-san, the "King of Portable Toys". “The power of science is staggering!” That’s the very first line you hear in Red and Green, isn’t it? (laughs) Anyway, because you responded so positively to the Wireless Adapter, we got Game Freak to check it out. It was great fun to witness those scenes of everyone trying it out. It really did turn into a gathering of people all saying: “The power of science is staggering!” (laughs) But I think that being able to really sense the possibilities of wireless technology led us to the Nintendo DS we have today. Later on, the developers of the hardware told me candidly that at first they thought we were crazy to sell something that costly bundled together with software. But they also said that the experience they gained with wireless technology proved incredibly valuable when it came time to work on the Nintendo DS. In fact, the Wireless Adapter meant that even just trading Pokémon felt really fresh and completely different from how it had been up to then. The scene at Pokémon events completely changed, didn’t it? And then suddenly we could distribute Legendary Pokémon in an instant. Then at just the right time, we made ‘Walk with me!’20 and I went to show it to you. After all, you are "the King of Portable Toys"! (laughs) 20’Walk with me! Do you know your walking routine?’ is a Nintendo DS software title released in Japan on 1st November 2008. It records the user’s steps at one minute intervals allowing the user to compare the distance they walk during their daily routine. As the software element of ‘Walk with me!’ was developed at Creatures Inc., I was really interested in it. Then when I was actually shown the Activity Meter21, I thought it was really interesting that there was no screen displaying the number of steps and that it was so light that you could just slip it into your pocket without it remotely getting in the way. Then, when the title was released, I began to walk around with the Activity Meter every day. 21The Activity Meter is a pedometer that was packaged together with ‘Walk with me!’ and records the number of steps the user takes. It can also be attached to dogs. You’ve got a dog, so I imagine that you were already in the habit of going out for walks. Indeed we’re not! It’s only splashproof22! (laughs) 22A splashproof item is designed to resist exposure to light rain and sweat as opposed to a waterproof item, which can be immersed in water. But because of that personal experience, I thought that I'd like to try to use that device in some way. 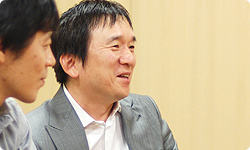 I thought that you could really develop the idea for a Pokémon title if, for example, we could put the pedometer data straight into a game. I also thought you could do something interesting with it using it as a successor to the Pokémon Pikachu pedometer. 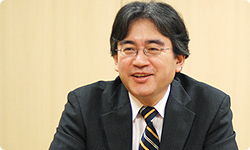 So you said: “Couldn’t this be made into the rebirth of the Pokémon Pikachu device?" When we were working on the Activity Meter, the Pokémon Pikachu had completely slipped our minds. Although they've got measuring steps in common, the manner in which they came about was completely different and none of the developers for the two projects overlapped. When you first made the proposal, I suddenly realised: "You're exactly right!" When you're developing a wide range of products, you can get it into your head that there's no connection between them. But sometimes something strange can happen and a chance occurrence will suddenly make you see a connection between them. I think this is often the way that new possibilities get uncovered. With Gold and Silver, we released Pocket Pikachu Color! Gold and Silver Together!23 This time round we wanted to include a device like that to show the way that the title’s scope has multiplied. 23Pocket Pikachu Color! Gold and Silver Together! was an enhanced version of the Pokémon Pikachu device released in Japan on 21st November 1999. 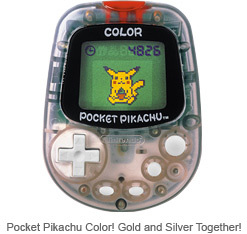 As well a having a colour display, it could also connect to Pokémon Gold and Silver. When I heard you say that, I knew exactly what you meant.